I’ve been on a Thomas Keller kick lately, so I decided to try this recipe from Ad Hoc at Home. It’s very similar to (and, in my opinion, not quite as good as) paella with one notable exception: the result of brining the chicken for 10 hours prior to cooking was the best chicken I’ve ever made. I will be looking for opportunities to use this same chicken brine with other recipes in the very near future. Make the brine – combine all ingredients in a large pot and bring to a boil. Boil for one minute (or as long as it takes to dissolve the salt), then cool. Can be refrigerated (covered) for up to three days. At least 6 hours but no more than 12 hours before mealtime – add the chicken to the brine (in a container large enough to hold the chicken fully submerged in the brine) and refrigerate for between 6 and 12 hours. If you leave the chicken in the brine for any longer, it will become too salty. Prep – make the saffron rice. Sautee the onion in the oil over medium heat for about three minutes. Add the saffron and reduce heat to very low. Cook for another 2 minutes, being careful not to brown the onions or saffron. Add the rice and turn heat back to medium. Stir constantly for two minutes until rice is slightly toasted. Add 2 ½ cups of stock and stir once. Cover with a parchment lid. Bring to a simmer and simmer for about 8 minutes. Remove lid and stir, ensuring to scrape all rice from the bottom of the pan. Add an additional ¼ cup of stock, cover with the parchment lid, and simmer. After the stock is absorbed, taste for doneness. If necessary, add another ¼ cup of stock, recover, and simmer. Repeat until the rice is fully cooked. Prep – blanch the haricots verts, then cool in an ice bath. Dry and refrigerate until ready to assemble the dish. Roughly chop the parsley. Prep – Without removing shells, use a pair of scissors to cut down the back of each shrimp. Gently open the shrimp and remove the vein. Rinse under cold water. 1 hour before mealtime – remove the chicken from the brine. Rinse under cold water, removing any herbs and spices that are stuck to it. Dry with paper towels. 45 minutes before mealtime before mealtime – Preheat oven to 400. Season the salt and pepper with salt, pepper, and Esplette. Heat some canola oil in a large frying pan over medium-high heat. Add the dark meat skin-side down. Lower the heat to medium-low and cook for about 8 minutes, or until skin is crispy. Turn and cook for another 6 minutes or until the other side is golden-brown. Transfer the dark meat to a plate and set aside. Return pan to medium-high heat. Add more oil if necessary. Add the breasts to the pan skin-side down and cook for about 8 minutes. Flip and cook another 5 minutes. Remove from heat. Spread the rice over the bottom of a large heatproof serving dish. Place half of the peppers and half of the green beans on top of the rice. Nestle the chicken pieces into the rice. Pour the ½ cup stock over the ingredients and place into the oven. 15 minutes before mealtime – Heat some oil in the frying pan. Add the chorizo and cook until brown on the edges, about 3 minutes. Transfer to a plate and remove any excess fat in the pan. Add the shrimp and sauté just until cooked, about 2 minutes per side. Transfer the shrimp to a plate. Add the wine and bring to a boil. Add the mussels and cover the pan. Cook until the mussels open, about 3 minutes. Remove from the heat. 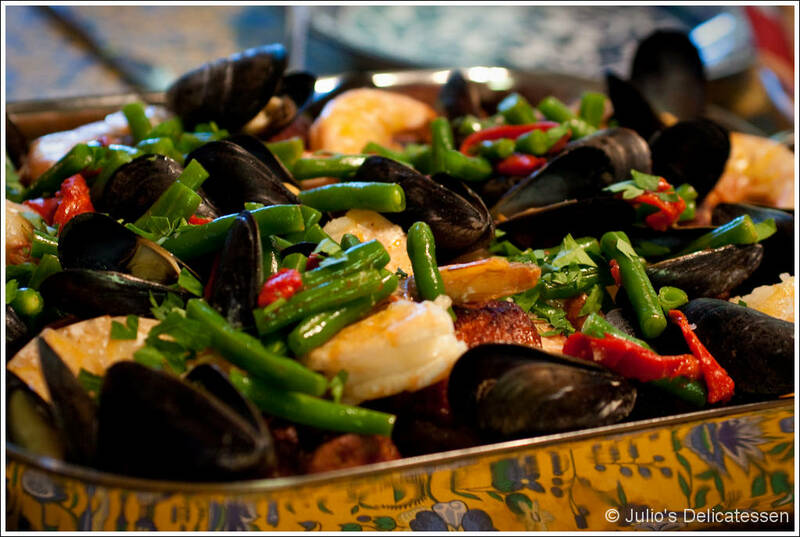 Arrange the chorizo, shrimp, and mussels in the baking dish. Cover with a towel. 3 minutes before mealtime – return the pan to the heat and add the remaining peppers and green beans. Sautee until heated through, then arrange on top of the chicken, sausage, and shellfish. Garnish with the parsley and serve. isn’t that haricots vert? or is that attorneys general?